The venerable Tamron 90mm macro is widely used by naturalists and other pros who need top imaging performance plus a longer lens-to-subject (working) distance to enable easier lighting and access to skittish subjects. Tamron’s “portrait macro”, loved by photographers all over the world, is now reborn as a Di lens that is perfect for use with both film and digital capture. Improved resolution, lens element coatings and chromatic correction make it a superb choice for either full-frame or APS-C format SLRs. 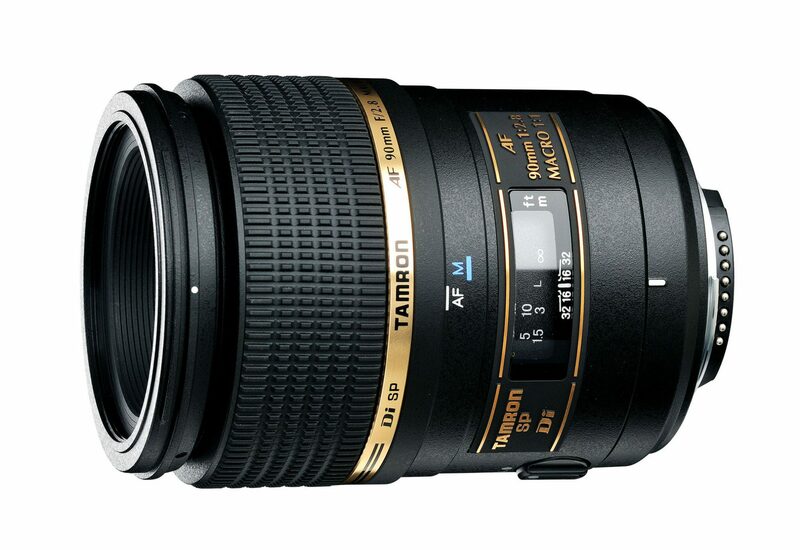 Tamron also makes a 90mm macro 1:1 with VC (Vibration Compensation) and USD (Ultrasonic Drive) autofocus, the Model F017. As a medium telephoto focal length, 90mm is particularly useful as a portrait macro lens when used with a film camera. When used on a digital SLR camera with a smaller image sensor, the lens provides a focal length equivalent to that of 140mm, so it can be used conveniently as a telephoto macro lens. As manual focus is a common part of fine macro photography, the rubber pattern on the focus control ring of the lens has been improved to ensure a better grip. In addition, finishing touches like the graphic display and imprinting provide better visibility and loan a highl-quality aesthetic presentation to the lens. Design improvements make the SP AF90mm Di the most lightweight* medium telephoto macro lens available. *The world’s most lightweight among AF90mm to 100mm F/2.8 class life-size macro lenses available at present in the market. The weight values used for comparison are of the Nikon mount. One major difference between digital and film cameras is how internal reflections may occur and to what extent. These internal reflections can cause unwanted flare or ghosting on the final image. In a film camera, internal reflections can be created inside the mirror box of the camera or from light reflecting off the film surface itself. However in a digital camera, the almost mirror-like surfaces of CCD and CMOS sensors make this much more of a challenge. Di lenses offer new anti-reflection countermeasures that are essential in lenses designed for use with digital cameras. The SP AF90mm Di features an improved coating technology that reduces the problematic reflections to the absolute minimum. *Values given are for Nikon mounts. **Nikon mount has a built-in AF motor.